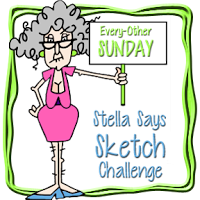 This is the sketch.. you can turn it (which is what I did) and then enter your card over at Catch the bug.. 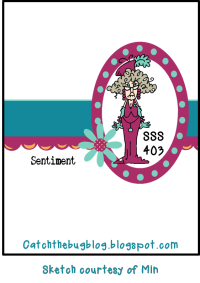 This is my card with the sketch turned and using the image Spring Boot I wanted to stay within the sketch guidelines and felt it needed a sentiment so I just added the Hello button. I like how it came out. I am recovering from hand surgery so really had to keep this quite simple. 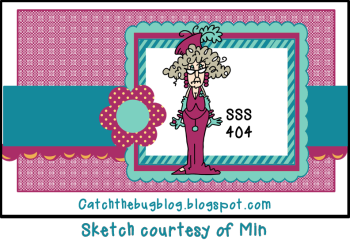 I wanted to make this a birthday card because we are in the new year so it's time to stock up on those must have cards.. I used some scraps of paper I had laying around.. OH my its was tuff.. I went through my scrap box and got rid of small pieces and pieces I knew I just wouldn't use.. some greens I had my hubby punch out leaves for future use and some circles but I just threw the rest in the garbage and immediately dumped it in the burn barrel... So these were the lucky pieces I saved. This is my card using the image called Winter games 1.. She is playing ball with her darling dog.. I thought it would make a cute birthday card for that child getting a dog for their birthday.. Or just for a fun birthday no matter what. I had to use my fun variegated ribbon again. I have a big spool of it so there is plenty to go around and I just love the colors and it helps tie in with the colors I did on the image. I hope you play along with us at Inspiration Destination where it's always Anything Goes. 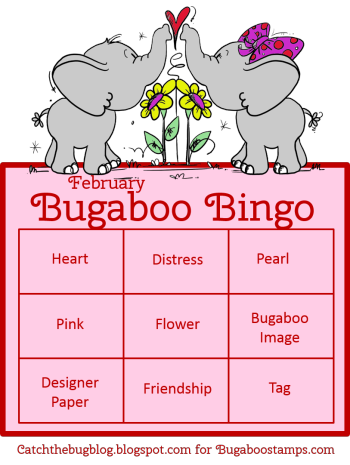 It's Bingo theme at Catch the bug's Saturday challenge.. 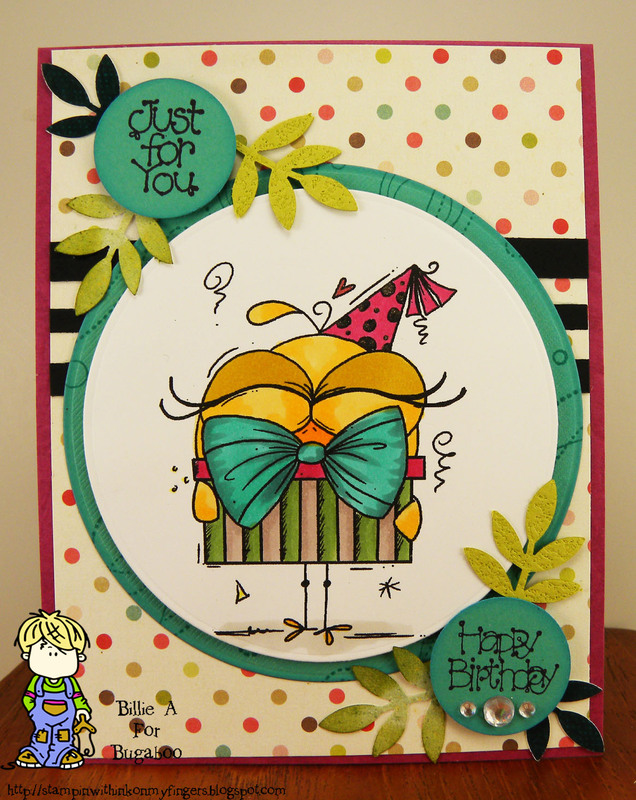 This is my card using the row.. Pearl / Bugaboo image / Tag.... I used another of the Birthday bash chick... I love them which I think I said on my last 2 cards.. I didn't want to over do on my card and so I just took a dauber and white ink and did circles for the background then added the sentiment on the tag and circle cut the image then added the half pearls to the fold corners.. Fun card.. Thank you so much for asking me.. 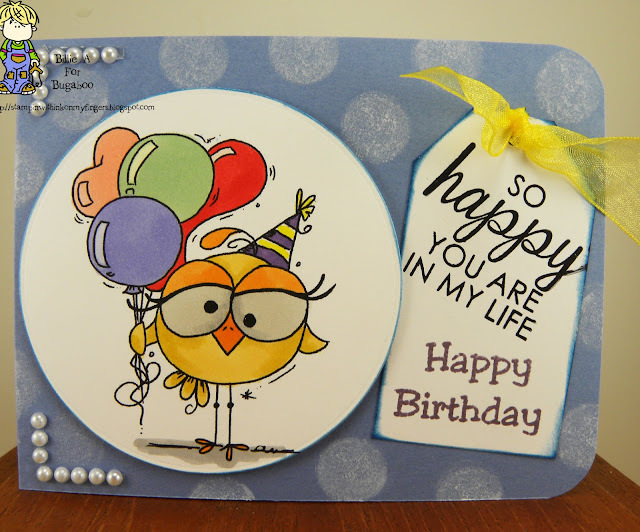 This is the card I made for the birthday challenge. I had this thick paper towel that I use to clean my brushes when I use my water colors and clean my work space of inks used in water color effect projects.. well it was just too pretty to throw away and knew someday I would find a use for it.. Well that day finally came. So I glued it to a piece of card stock and let it dry. Then used My Favorite Things camellia flower die and adhered the pieces together and set it aside to dry. 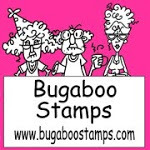 Then I took a stamp set from Stampin up called what I love.. 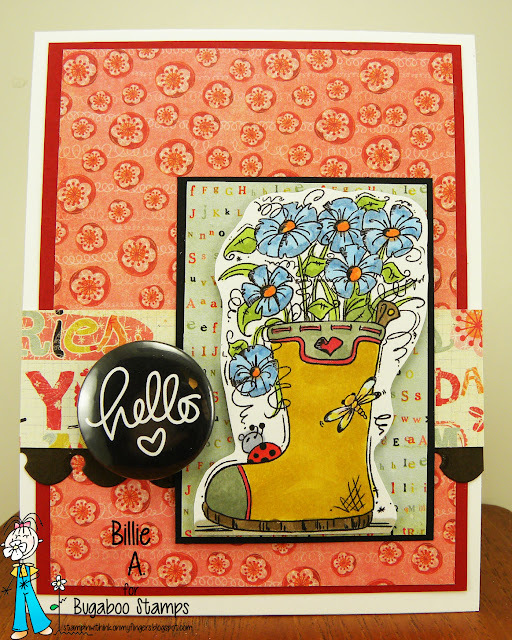 I stamped the background flowers using paper trey inks. I did the little purple flowers with ranger ink. I added ranger yellow and brown to add more colors. I then die cut some stampin up botanical leaves and Martha Stewart die leaves and added them under the now dry flower. I then added the sentiment also from Stampin up. To complete the card I added a little green gem inside each purple flower. 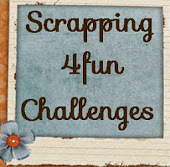 I hope I have inspired you to make your birthday card and play along at Scrapping 4fun. 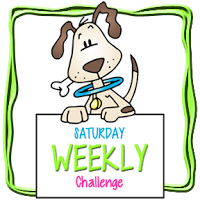 The challenge is for two weeks. recipe: pretty much what I said above.. 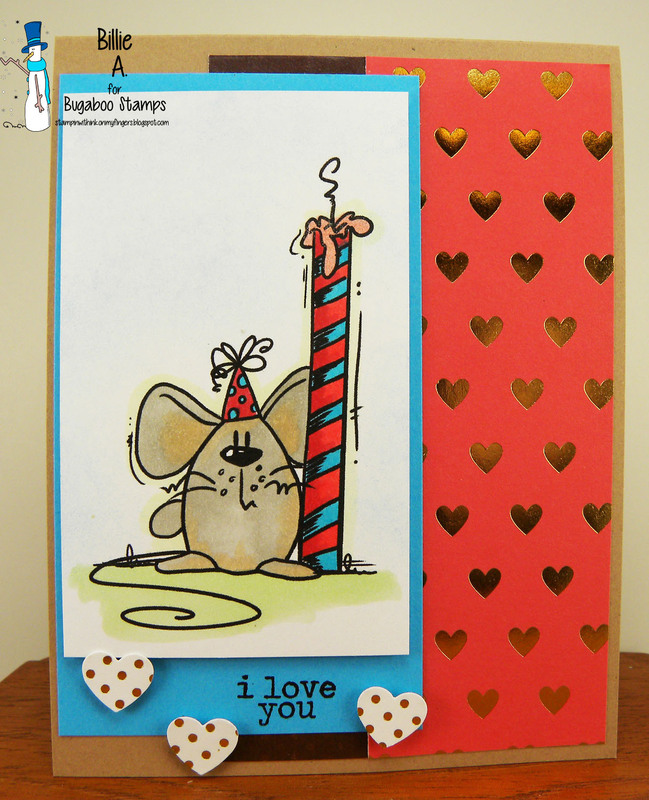 I am using the image called MOUSE CANDLE I made this for an anniversary card.. but it could be a birthday, mothers day, fathers day.. pretty much any celebration.. with it just being Valentines day a couple of days ago I decided to make it an anniversary card. I had some scraps laying around so just did my thing and this is what I came up with.. I like it.. I am using the image called Peaches present.. I love elephants.. they remind me of my father as he use to collect them. 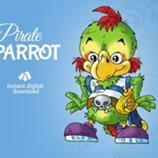 I smile every time I use the images.. She is so cute and I love the little mouse peeking out from behind her leg.. 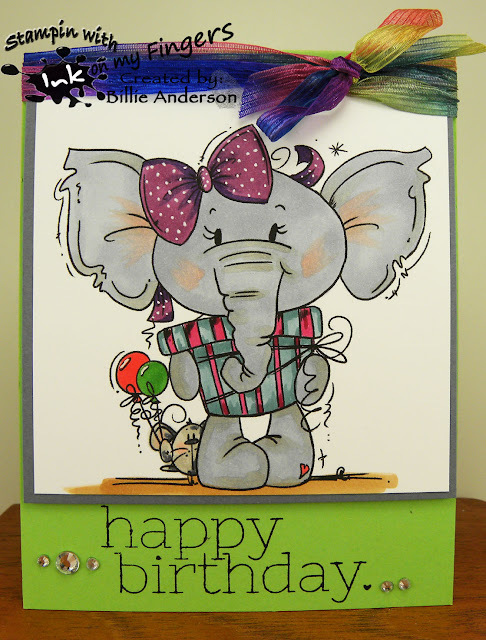 I added some white gel dots to the ribbon to give it a little texture.. Use some of my favorite ribbon. Now it's your turn. 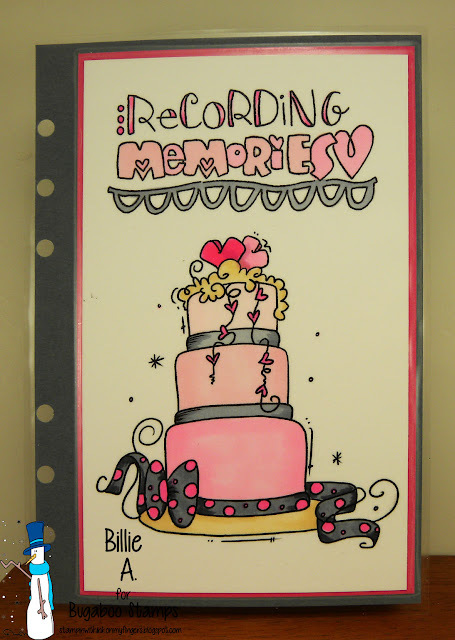 You have two weeks to enter your card and just make sure it has a birthday sentiment. 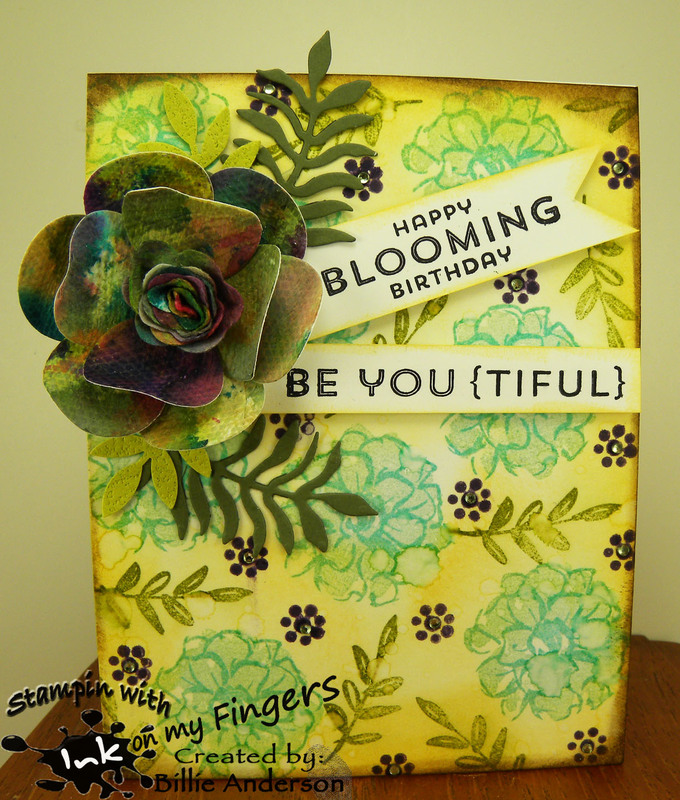 This is my card using the image called Holler back girl.. I don't know if the sentiment is true during these cold dark days of winter... but I do like the sentiment and I know I have friends who are better than summer sunshine ... ok equal to summer sunshine. I do love summer a lot also.. I used some background paper from DCWV and some old paper zone dark navy blue cardstock and added all to a yellow card base.. 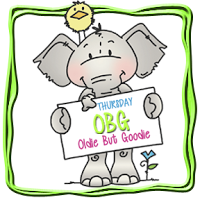 I used the word bubble from Simon says and a rhinestone swirl to give it some added texture. I colored the image with copics and used some quick quote ink around the edge of the speech bubble and the image. Well today is hubby's and mine 34th anniversary.. Wonderful years. We have known each other since early 60's but went our separate ways (he lived in Oregon I lived in Washington state and in our mid teens was too hard to get together) then reconnected in the early 80's.. I am so glad he is in my life. Hope for another 34 years..
Catch the bug Saturday theme is "KEEP IT SIMPLE"
This is my "KEEP IT SIMPLE" card.. I used the image called Floral Trio Frame 1 I just colored the image simply and added the embossed sentiment and added some half pearls. 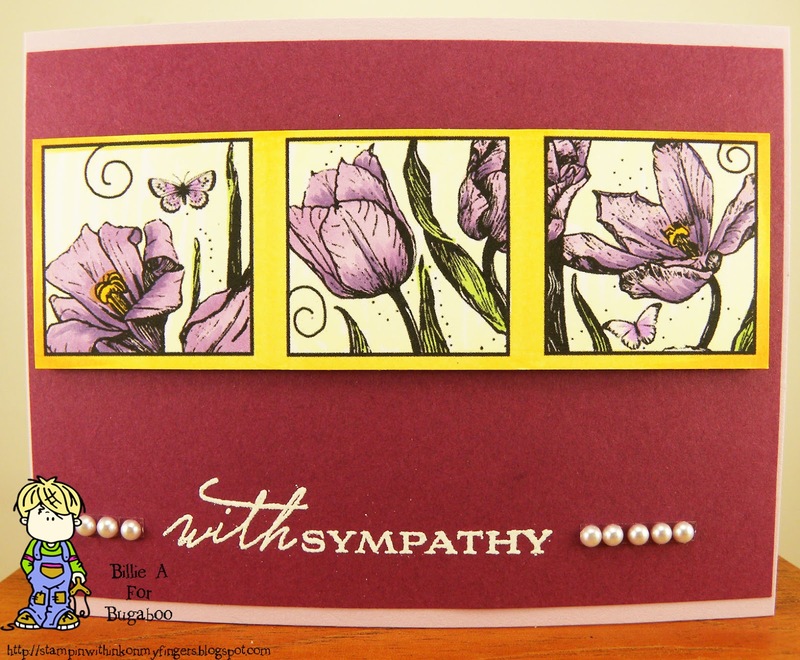 The card base and darker purple are all stampin up.. 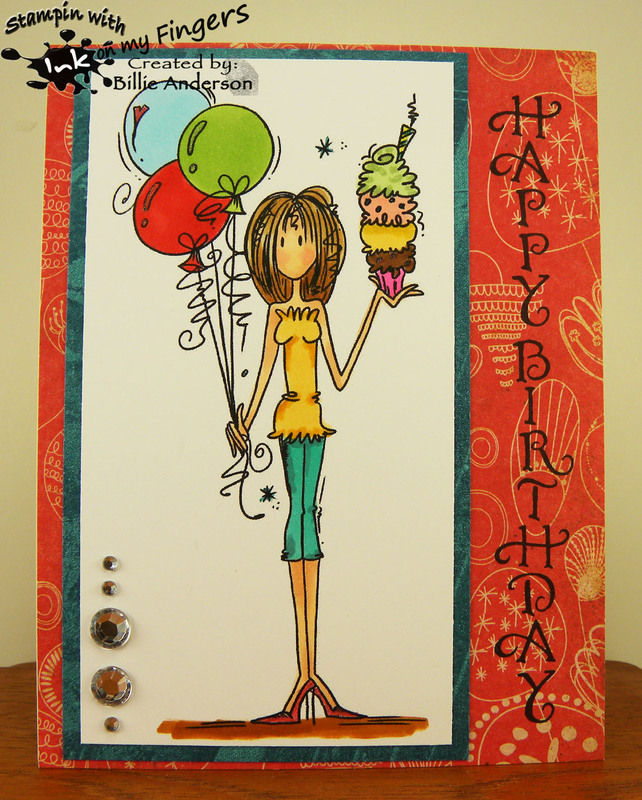 This is my card using the image called Mocha time.. 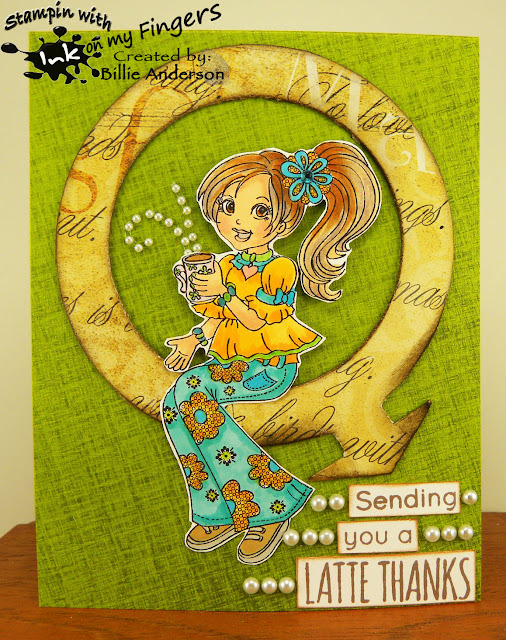 I had this chipboard piece that has been screaming for me to use.. this was the perfect time. I had a piece of designer paper scrap from quick quote and adhered it to the chipboard piece and added it to the card front. I colored the image and cut her out and sat her on the edge. I used some small half pearls to give an effect of steam from her mocha.. I added some larger half pearls to the sentiment. I hope you play along and post your Anything Goes card over at Inspiration Destination.. I really like the pink and grey and so went with that color theme. I colored with copics and laminated the whole piece and punched my holes so it's ready to add. It's Saturday and at Catch the bug the first Saturday of the month is Anything goes.. I chose to use another of the birthday bash chicks .. I am really loving these cute little chickies.. 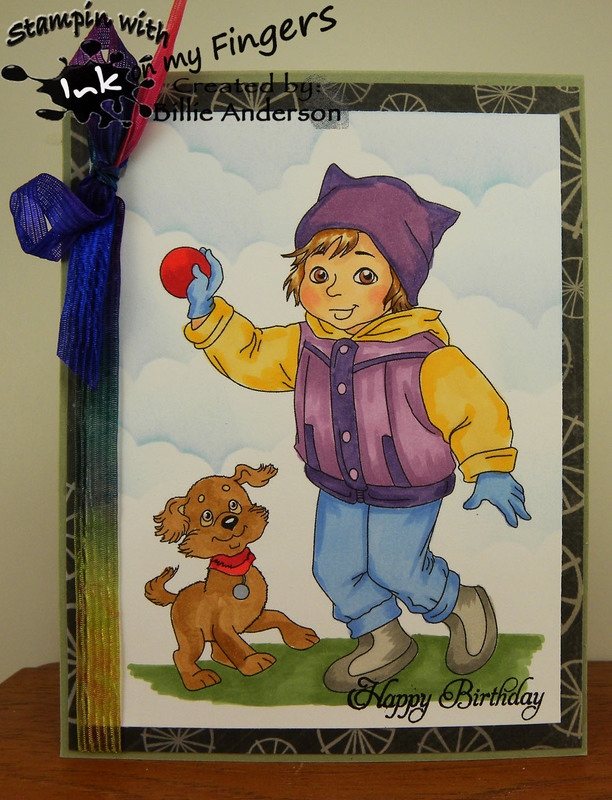 I had fun bringing her to life and making a bright happy card. 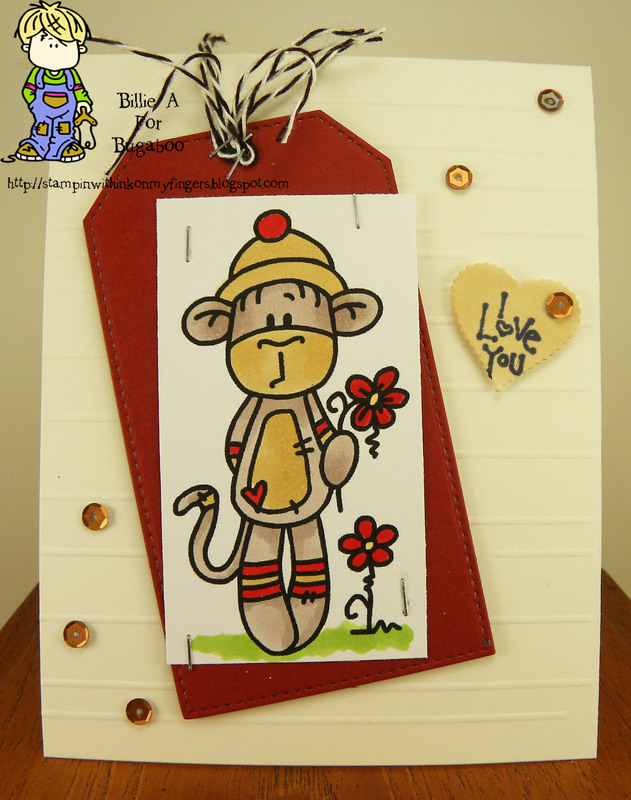 You can find this cute monkey at in the Bugaboo store.. it's free for a week so hurry up and grab it.. This is my sock monkey card. I have a sock monkey that is quite old. I hold it dear.. 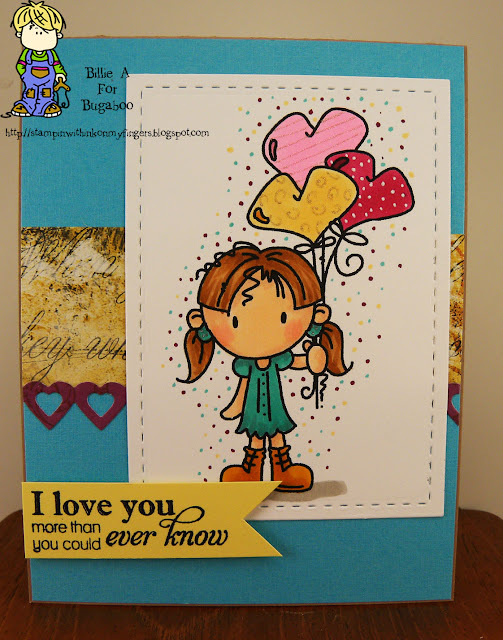 I used a tag that Monika at Creative with Monika gave me for my birthday.. I love tags and don't use them often enough and so this was perfect. I stapled the colored image using my tim holtz mini staple. I added a heart from a die /taylored expression and d.o.t.s. sentiment. I added some sequins and to give the base some texture I used my scor buddy and did various width lines here and there.. I added some jellybean twine and called it done. Our sponsor for the next two weeks is Great Impressions... I am using a very old stamp I think it's eyelet lace heart.. I colored it with copics and the sentiment inside of the heart is from Simon says. 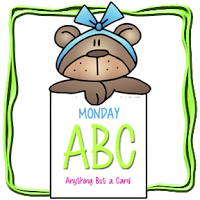 You have two weeks to enter your card and just make sure you use a love sentiment. 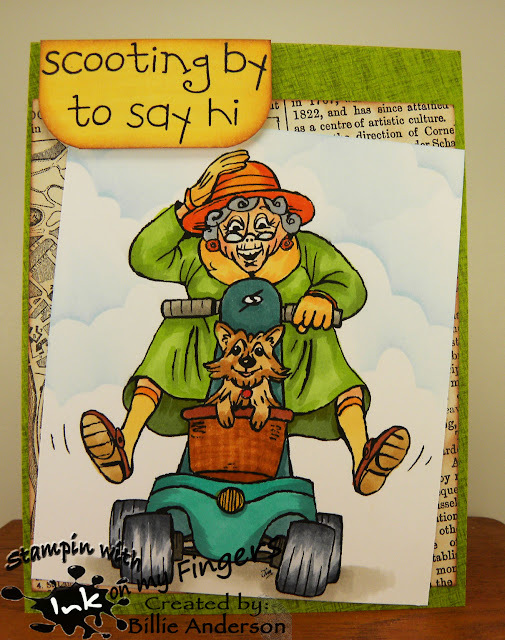 I am using the image from Just inked lined called Renie and Scrappy.. She's just a scooting by to say hi.. I don't know if I would have that happy look that the dog has.. I guess it depends how fast she is going.. LOL.. I hope you head over to enter your card over at Inspiration Destination.. remember it's always anything goes.. 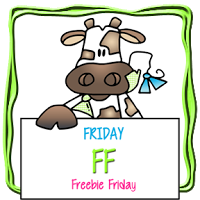 I hope you play along and post your card over at Inspiration Destination.